Personalised Jewellery by Jewels 4 Girls. 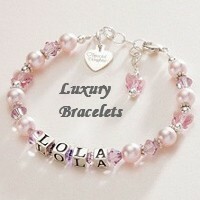 Jewels 4 Girls specialises in personalised jewellery gifts for girls of all ages. Ranges include personalised wedding jewellery, bracelets with engraving, name bracelets for girls and a beautiful range of birthstone jewellery. Sympathy Gifts and Bereavement Jewellery by Someone Remembered. Someone Remembered offers a lovely range of remembrance jewellery. Many items can be personalised with free engraving. 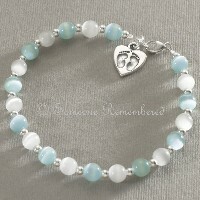 If buying for someone who has lost a baby or child there is a unique range of infant loss jewellery and for someone who has lost a pet there is a section of pet loss jewellery and gifts. Also on the site you will find real flower jewellery and angel themed jewellery. Heaven's Blessings specialises in personalised Catholic jewellery and offers a unique and very special range of personalised rosary beads, rosary bracelets with engraving and many gifts suitable for First Holy Communions, Confirmations or Baptisms.